I’m not a sports fan, but I knew someone who was. My son Matt played baseball from tee ball through high school, and is an ESPN addict. Later that day I texted Matt that Justin Berlander was a regular customer where I worked. (Yes, I thought Justin’s last name was “Berlander.”) Matt texted back, Do you mean Justin Verlander? Okay, sure whatever. Yeah. That guy. There aren’t very many sports figures Matt would like an autograph from but he believed Justin Verlander was going to have a history-making career. But still. Ask for his autograph? I don’t know. How would I? Buy a good quality baseball and the next time he comes in ask him to autograph it. Trust me, Mom, he gets this all the time. He’s used to it. Yeah. But still. Wouldn’t that be tacky? And sort of weird? Maybe if I went to one of the spring training games, I could manage it. But I probably wouldn’t. Was there any guarantee that if I did, I could get close enough to Justin to get a baseball autographed? I laid awake the next few nights fretting. I’m not a groupie. I would feel weird asking for an autograph. I’d be embarrassed. This guy’s a customer. How could I impose on him? I’d never do something like this for myself. But I’d do it for my son. Maybe. Maybe I could do it. March 18, 2013. I knew time was running out. Spring training would be over soon. Justin would be gone and I’d have missed my window of opportunity to get his autograph for Matt. I’d prayed to God to give me courage, gumption, whatever it was I would need to get over myself and do this for my son. Lo and behold one afternoon Justin walked in when I wasn’t busy. This was my chance. But I’d never bought that good quality baseball. What was I going to have Justin sign? A napkin? The back of his credit card receipt? A light bulb came on over my head (aka Divine Intervention.) 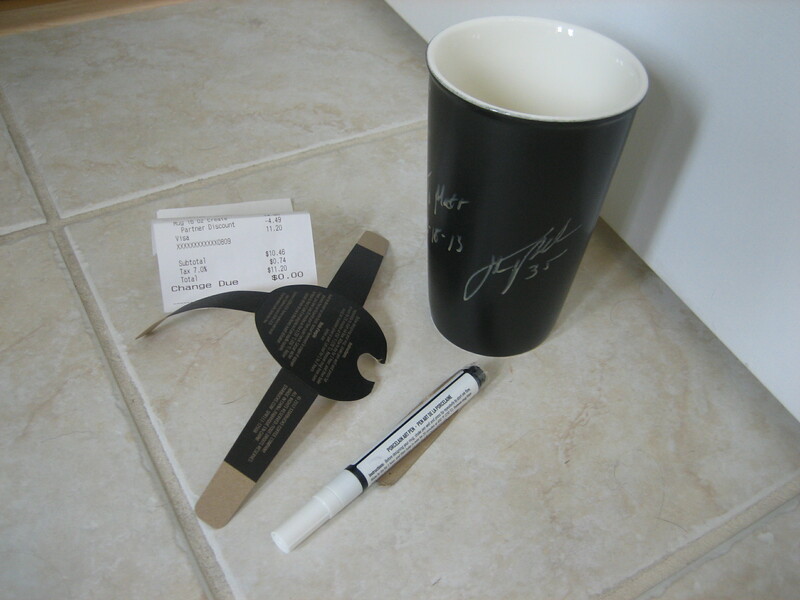 In our store we sell mugs you can write on with a chalk pen. I grabbed the only one we had left off the shelf. Justin had already paid for his drink and was at the handoff counter when I approached. I was such a geek, but Justin couldn’t have been nicer. He got his drink and left after I gushed my thanks. Probably, he was very glad to escape. I was on a high. I’d done it. Overcome my shyness and discomfort about asking a celebrity for something. I took the mug home and following the instructions put it in the oven to bake. But I forgot to set the timer! Luckily I rescued it before it exploded or the chalk burnt off. After it cooled I carefully wrapped it in layer after layer of bubble wrap. 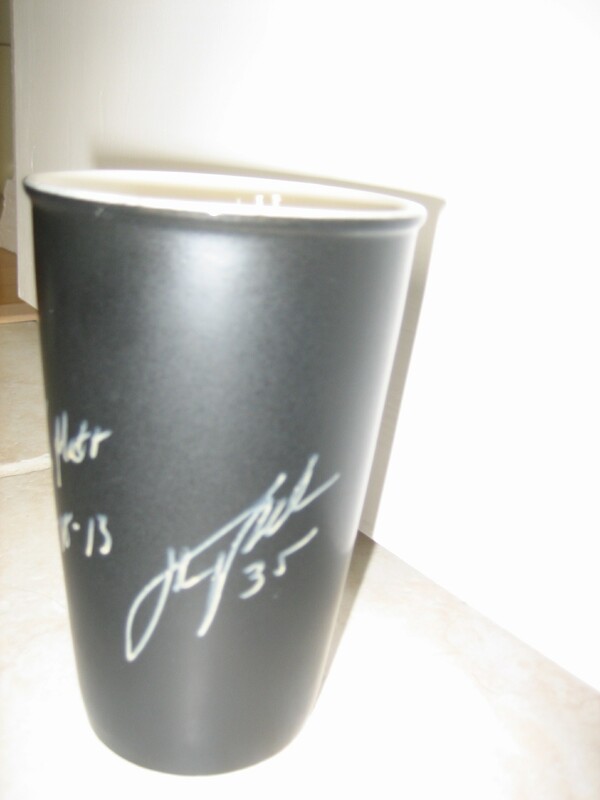 The only problem with an autographed mug is that it is breakable. This was going to make a great birthday present for Matt. 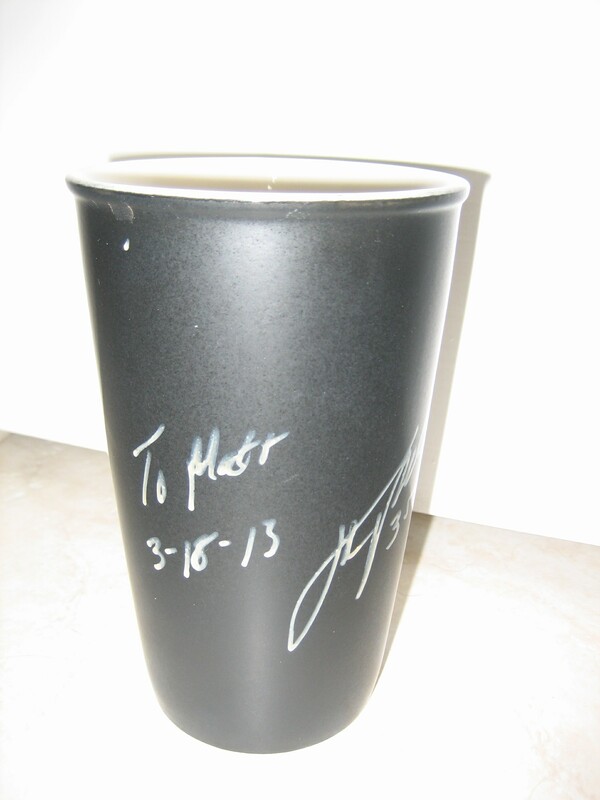 Every few months I checked the mug to make sure the autograph hadn’t disappeared or rubbed off. 2013 has been a tough year for Matt. I kept thinking about the mug. I hoped it wasn’t a dumb idea. Everybody has autographed baseballs. Who’s got an autographed coffee mug? With the receipt? And the chalk pen used one time by only one person? No one else, I bet. Still I wondered is this a good birthday present or is it just stupid? Finally, it’s October. We’re packing the car to visit Matt a few days after his birthday. My husband picks up the bag with the mug in it and drops it on the floor. He’s lucky it didn’t break (all that bubble wrap, remember) or this story would have a very different ending. When Matt unwrapped the mug from its many layers of bubble wrap, at first he thought it was just another coffee mug. The he stared at it and studied the writing. “Is this Justin Verlander’s autograph?” Matt gives me a high five. I’ve learned I can’t solve all my kids’ problems. I can’t take away their pain or make their lives perfect. But I do what I can. And sometimes, with the help of a guy like Justin, I can bring them a moment of joy they’ll remember and something they’ll treasure forever. autographs, barbara meyers, children, gifts, justin verlander, memories. Bookmark.